Tory Brennan - great niece of Dr Temperance Brennan - and the Virals return for their most terrifying adventure yet. Morris Island has barely had a chance to return to normality after the high profile trial of the Gamemaster, when two local students seem to vanish into thin air. Tory Brennan and the Virals pack move quickly in their attempts to discover what has happened to their twin classmates. But the pack’s canine powers are growing wilder, and it is becoming ever harder to conceal the secret which protects them. When Tory and her friends find evidence of blood in the students’ basement, they realise that the disappearance is no game. But in order to save the twins, the Virals must risk the exposure of their powers, and in doing so put even their own lives in terrible danger. Disappointing entry in a great series! Exposure is the most lacking entry in the so far stellar Virals series. I guess every series is bound to have, or maybe even be entitled to have, a slightly weaker entry but it was still a little disappointing. Exposure clearly sets up a really interesting conflict for Book 5 but it came at the expense of a polished book 4. The mystery in Exposure just wasn’t juicy enough. It felt like a scavenger hunt – clues were collected, assembled and the mystery was all wrapped up in a neat little package promptly. I’ve come to expect far more from the Virals team but I hope this doesn’t mean that characters have reached the point where they’re too smart for the writers to keep up with. But if anyone can work a long-running forensic mystery series, it is Kathy Reichs. You’d think a high-concept series about genius, well-connected, SUPER-POWERED teens would stretch credibility beyond breaking point at the best of time but I’ve always found the series to be grounded by the day-to-day drama that complicates their clandestine sleuthing (and vice-versa). In Exposure though, all the drama subplots were unceremoniously dumped and after they were bought to such a tantalising simmer in the previous book. This disappointing and added to the uneven and unsatisfying book. Finally, I have to express a bit of concern about the new series co-writer, Kathy’s son Brendan. I praised book 3, the first shared novel, for staying true to voice but there was some clunkiness here. The pop-culture references came thick and fast, standing out like big neon thumbs by the end. Is this a sign the younger Reich’s is taking more of the helm? I don’t know but it needs to be dialled back before it becomes a problem. It’s always weird to review books deep into an ongoing series – no one is going to pick up this one out of order to read no matter how glowing my review and no one who has read and loved the previous books are going to not continue no matter what I say. To those who haven’t started Virals yet – I say do it immediately. The series as a whole is excellent even is Exposure is wobble. Likewise, to those who are perhaps on the fence about the last three, Exposure won’t win you over but it should be read. It is essential to continue on in the series that I still have much love and high hopes for. Much of the storyline was given away. The ending 10 minutes clarified a single scene that had no verification. 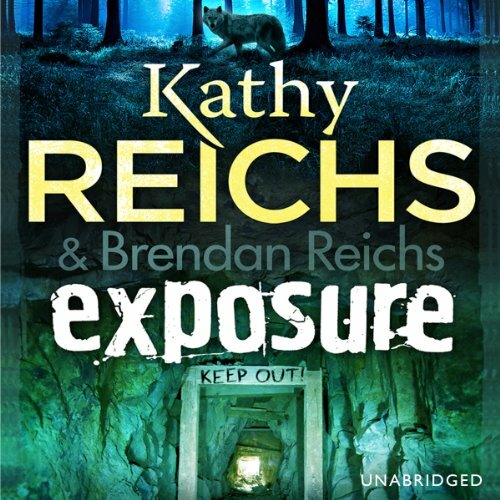 Where does Exposure rank among all the audiobooks you’ve listened to so far? Which character – as performed by Christin Milioti and Brandon Reichs – was your favourite? this series is just getting more and more gripping. Cliffhanger ending this time so need more credits straight away. Can't wait a month for the next one! ! !